A Poker Strategy Can Keep Bad Luck Away! Poker is a game of chance and skills. Though there is no way for you to control the cards that you will get, you have your hands and mind on how you are going to play poker with Bitcoin. There are widely used strategies players try their hands on to increase the odds of getting the best hand. However, just like other casino games, there is no sure-fire Poker strategy. But since there’s no harm in trying, why not take a gamble? After all, you will be putting nothing at stake aside from your brain cells. This isn’t exactly a winning strategy, but knowing all the winning poker hands is essential in deciding whether to fold, check, raise, or bet. The least hand you can have is a high card. A high card basically means that you don’t have any combinations at all—not even a pair. If you have a pair at the end of the round, then you may take the pot if your pair beats the other pairs on the table and if no one has a higher poker hand. Clearly, your pair is no match to a two pair, which simply means you have two sets of a pair, while a three of a kind beats all of these hands. 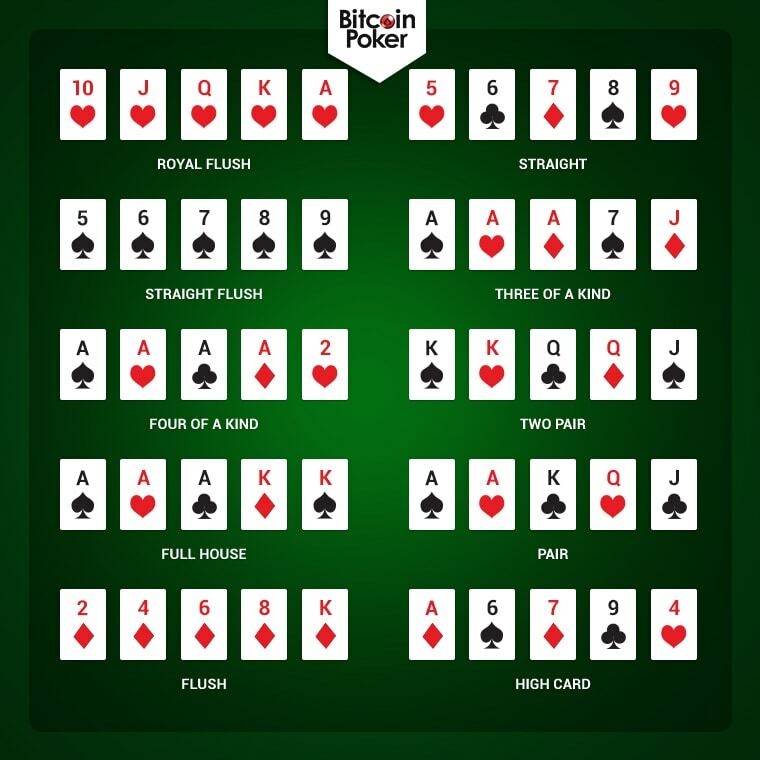 The real challenge in mastering the hands starts with the straight all the way to the royal flush. 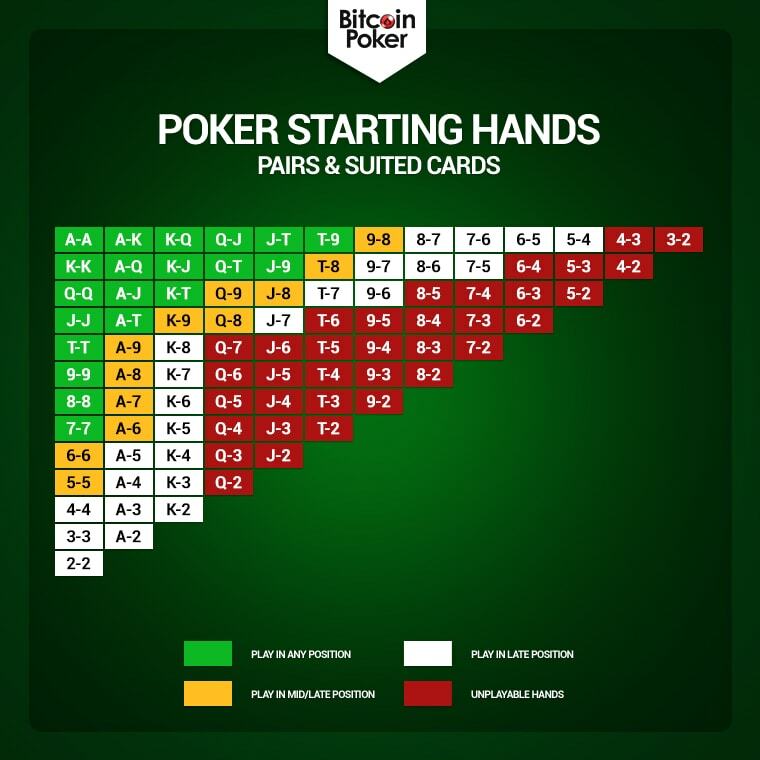 Check the poker hands chart and see the combinations you need to form in order to increase your chances of winning the pot. Royal flush is the highest hand you can get, followed by straight flush, four of a kind, full house, and flush. 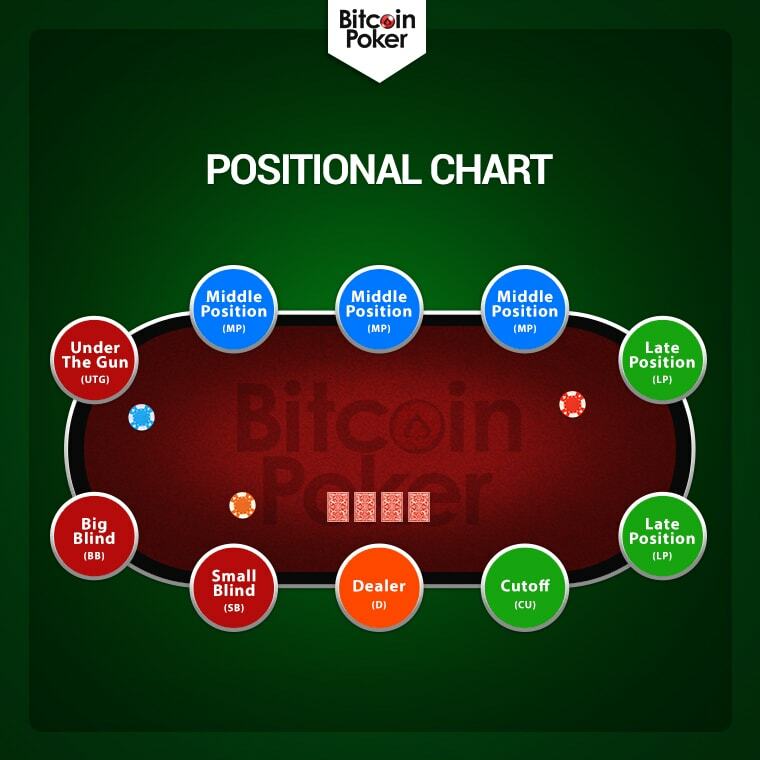 Playing Bitcoin poker can also be about where you’re at on the table. It’s a known fact that getting seated at the right spot qualifies as an effective poker strategy. Keep in mind that where you’re seated is also important in the game and it plays a role in increasing or decreasing your probability of winning the round. Those who occupy the early positions have to act first. Based on our positional chart, these are the ones in red with the labels: Under the Gun, Big Blind, and Small Blind. If you’re playing in early position, you have less information, but you must make a decision quickly. This is where such players are at a disadvantage. The primary rule if you’re playing early is to only play if you have premium hands. Meanwhile, if you’re in a middle position, you have a good seat since you already have an idea what the early players are up to. Technically, it’s ideal to raise if you have any pair, if you are in this position. Check out the blue-colored seats on the chart. But if you’re after the best seats, it has got to be the late position. You’ve practically seen everything that has been going on with the players in the early and middle positions. You have a higher chance of winning if everyone else has folded, even if you have an average hand. The best seats are those on the right of the dealer. The main points to remember when it comes to the positions are to play more cards if you’re in a late position. Play good hands if you’re in the middle, but only play strong hands if you’re in the early position. Constantly folding won’t take you anywhere in poker. Just like in any battle, you need to be aggressive to win the pot money. When talking about aggressive play, this pertains to betting and raising to stay in the game. Passive play, on the other hand, refers to checking and calling, which are simply matching the bet of the previous player or choosing not to bet for that turn. By being aggressive, you can force the pot to increase and exude confidence that you have a good hand, unless of course if you’re bluffing. However, it doesn’t mean that you must always bet or raise. Based on your position, there is a right time when to play aggressively. Never enter a battlefield without the best weapons you can get because you surely won’t last a minute. The same goes in poker. At the beginning, you’ll be dealt two cards facing down. With just two cards, deciding to play on or to fold can be challenging. If you’re fortunate enough to be dealt a pair and suited cards, keep in mind the options you can take. Those in the green box are the ideal hands you would want to start with. These are also perfect for all positions. The orange boxes, however, are ideal for players in the middle or late positions. Players in the late position are encouraged to start with any of the combinations in the white box. If you happen to get cards that belong to hose in the red boxes, then fold. Meanwhile, it’s not always you get suited cards and pairs at the start. This is why you must also know the perfect starting hands for the unsuited cards. If you’re in the late position, your best option is to start with the combinations in the white boxes. You can also play on if you got cards in the orange boxes. In the event that you’re in the early position, your only hope is to have a starting hand of A-K, A-Q, A-J, A-T, K-Q, and K-J. The starting hands in the red boxes are what we call unplayable hands. There will be a pretty big hole in your game if you do not know how to size your bets properly. Given this, it is important to use money management systems in your game. Though these systems cannot help you in getting a winning hand, these will help you control your money to ensure that you will win something out of your wagers. The most popular systems are Martingale, Reverse Martingale, Paroli, D’Alembert, Fibonacci, and others. It is important to keep in mind to choose a Poker strategy based on your preference. Since you have to master that strategy full well for a perfect application in your game, it is a must that it matches your palates, ability, bankroll, and other aspects you need to consider.